As soon as you walk up to the home and see the simple, but because of this even more impressive, water element in front of the house, you know you are about to enter a home owned by people with excellent taste. The interiors show a perfect balance between design and functionality. The home itself is divided into several independent sub structures, and because of this guarantees a perfect respect for privacy, without creating a distance in between the guests. Located on the north side of the Bay of Banderas and secluded from the rest of the development in Punta Mita, Ranchos Estates is the most exclusive estate development in this world-renowned resort community. Within its limits, Ranchos Estates is home to the crown jewel homes included in our portfolio. Guests will be able to enjoy refined service, provided by the staff of each home, or, in the unlikely event you may need additional services. Guaranteeing a maximum of privacy and comfort to its guests. The home is located just a couple of feet above the secluded whit sand beach The main building house the kitchen, which would make the average chef envy, the dining area and the living area. The house is decorated in a very fine style, always respecting comfort and functionality The master bedroom is a second independent, two story building. Housing the master bedroom, a walk in closet, the master bathroom with in and out door showers and Jacuzzi, a sitting area and a complete office studio with own terrace on the second floor. The second and third master bedroom each with ocean view and their independent terrace are located on the first and second floor of the third building. Both have walk in closets and have a bathroom with showers and Jacuzzi. In addition to this every bedroom in the house has a refrigerator and a private save in suite. Besides three more bedrooms the home possesses as well an in house theater, with all the necessary equipment, as well as a GYM and an extra service quarter for staff. All these quarters are located in the fourth building and are all located on the first floor. Custom fire feature with comfortable seating overlooking the beach. Use of the Residents Beach Club, Porta Fortuna Beach Club and Kupuri Beach Club (subject to prior reservation and availability). Luxury power boat (with licensed captain and crew) for the use of our guests (12 pax). Tenants of Estate Jaguar benefit from the highest level premier golf membership providing access to Pacifico Golf Course, Bahia Golf Course, tennis centre, fitness centre, Residents' Beach Club and Kupuri Beach Club. Ranchos Estates is a private, gated community of exquisite custom design oceanfront residences, all of which are located on a beautiful beach of white sand just a three minute drive from the Punta Mita development. All the home sites average over an acre is size which guaranties their privacy, some of the most spectacular homes in all of the Banderas Bay are located in this community. These estates offer more privacy, seclusion and security than the other residential communities that are located within the Punta Mita Resort; also they are within walking distance to 'La Lancha' one of the best surf breaks in the Banderas Bay while having several small bays that are ideal for swimming and snorkeling. 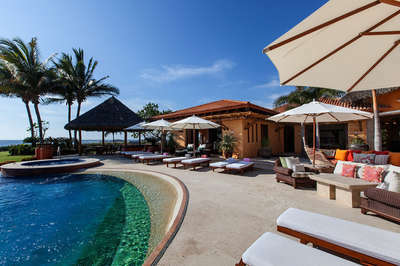 Although this community ain't located inside the Punta Mita Resort, all the guests have access to all the amenities located within the Punta Mita Resort.